There are some LEDs are built-in on PHPoC board. This helps user quickly get started without wiring anything. These LED were already connected to IO pin of PHPoC device. These LEDs are turned ON by setting IO pin of PHPoC device to LOW (0 V). These LEDs are turned OFF by setting IO pin of PHPoC device to HIGH (3.3 V). Upload example\p4s\02.html_text\01.uio_ob_led to PHPoC Blue/Black. Access webpage on PHPoC using Web Browser on your PC or smart phone (See How To). Source files includes:index.php file, which contains source code of web page. It is only run in response to request from Web Browser. Source code of index.php file is composed of HTML, CSS and PHPoC code. PHPoC code is interpreted on on PHPoC device. Setup IO pin to output mode. Get the requested state from HTTP request. Control the state of built-in LED according to the requested state. Read the current state of built-in LED . Print out the current state to webpage. Print out hyperlink, which can be used to toggle state of built-in LED to webpage. 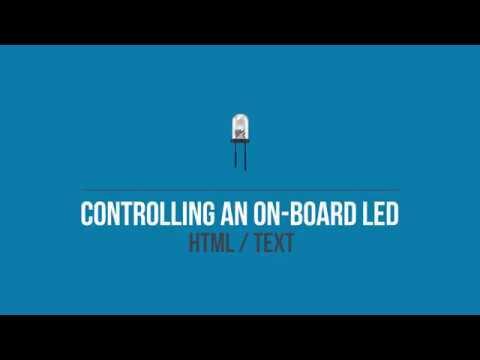 LED - Controlling LED from Webpage with Image. LED - Controlling Buzzer via WebSocket. Last edited by support; 02-09-2018, 08:59 AM. All times are GMT+9. This page was generated at 05:38 AM.